Fancy-ish pasta like this is date night pasta. At least, that’s how it works in my house. With Valentine’s Day being around the corner, I’m reminiscing on the countless date-night-in evenings that BL and I have shared over the past (almost) decade. 99% of the time, they involve pasta. It’s funny to look back on our relationship, from the initial dating phase, to love, to marriage. We spent the weekend in Kansas City with BL’s best man and his new girlfriend and naturally, the conversation turned into how we met. I knew I was going to marry BL the moment I met him. Which, now that we are doesn’t seem quite as creepy as when I announced it to my mom 10 minutes after our first get-together. I’m fairly certain that this fits squarely into the lust category but since it all worked out for the better, I’m calling it love at first sight. BL was my tour-guide on the first day of grad-school and I was smitten within seconds. Naturally, he had a girlfriend at the time, which actually worked out for the better. We become close friends over the course of the year and when they were over, we were ready to take our relationship to the next level. He jokes that I eventually wore him down into dating me, but I’m fairly certain it was the pasta. Early into our dating history, I arranged for a nice dinner in. I was still a broke graduate student, so it seemed like a big deal at the time to offer appetizers, wineand dessert. Of course, I opted for homemade pasta as the main course. Go big or go home. Thankfully, pasta is the way to BL’s heart. Years later and I’m still opting for a monthly date-night in. Pasta is almost always at the center of the table with good reason. 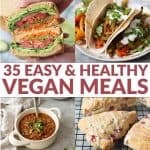 It’s a nice option for two vegetarians and it’s the perfect meal to linger over, especially now that I can afford a decent bottle of red. 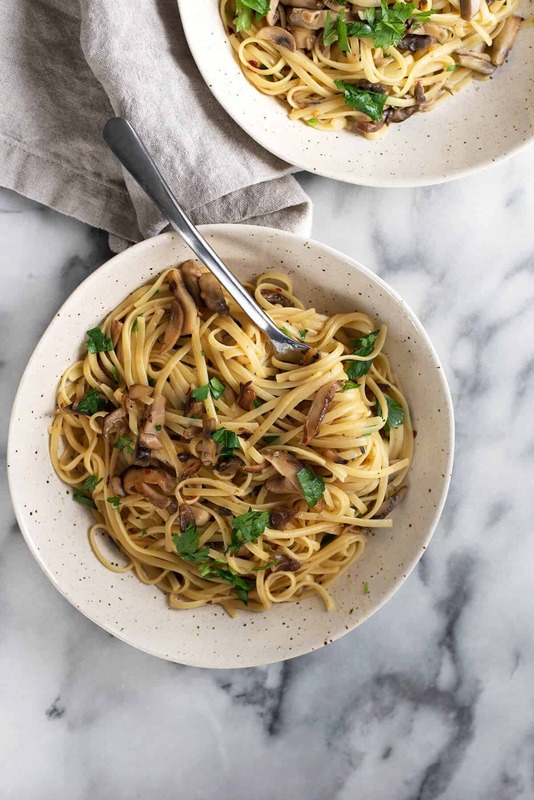 This shiitake pasta will almost certainly be on our table tomorrow night and I’m thinking it should be on yours as well. While any mushroom variety will work, I love the delicate, almost buttery flavor that shiitake mushrooms give. I’ve been finding them for a fairly good price, $8.99 a pound, but if they are quite costly, then cut some of the mushrooms down with regular button or baby bellas. Either way, I’m letting you in on a secret to creating the best tasting pasta at home, sans fresh or homemade noodles. I even created a video below to show you how it’s done. The trick is cooking the pasta very al dente. If the package calls for 9-10 minutes of cooking time, I’ll let it cook for 5-6. Then, add the under-cooked pasta to the already finished sauce with a spoonful of pasta water. Regular water won’t work here as the starches from the cooking water help finish the cooking process and let the sauce cling to the noodles. Toss, toss and toss. Once the water is mostly absorbed, add in another spoonful. Keep tossing, repeating this process for another few minutes until the sauce has thickened and the noodles are perfectly al dente. To finish the dish, add in a tablespoon of butter (or vegan butter) and toss the whole thing together one last time. This gives the pasta a silky finish and adds body to the sauce. Sprinkle in parsley and serve. For a complete date-night dinner, I recommend ending the meal with either my red-wine poached pears or chocolate-cherry mousse cups. Either way, Happy Valentine’s Day to you and whomever has your heart. 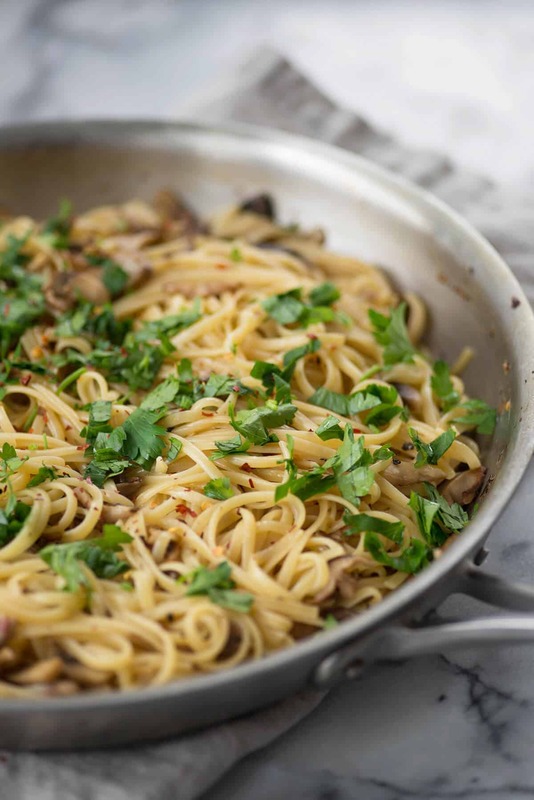 Linguine in Shiitake Wine Sauce! You can’t believe this pasta is vegan, super creamy with a trick to making glossy, delicious pasta. Heat the olive oil in a large skillet over medium heat. Add the garlic and cook until just browned, about 30 seconds-1 minute. Add the mushrooms and cook until browned and all water has evaporated, about 10-15 minutes. 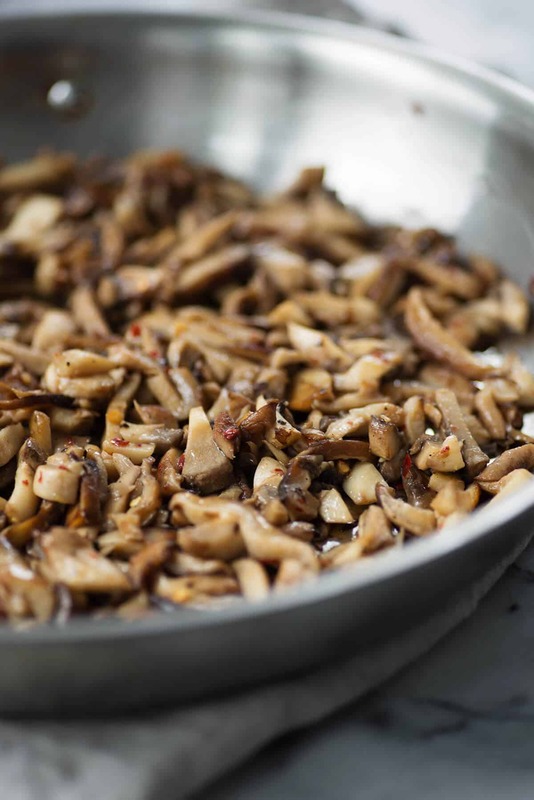 Stir often, making sure mushrooms don’t stick to the bottom of the pan. Once the mushrooms are browned, add in the wine and scrape the pan, getting up any browned bits of mushrooms. Simmer until most of the wine has been absorbed. 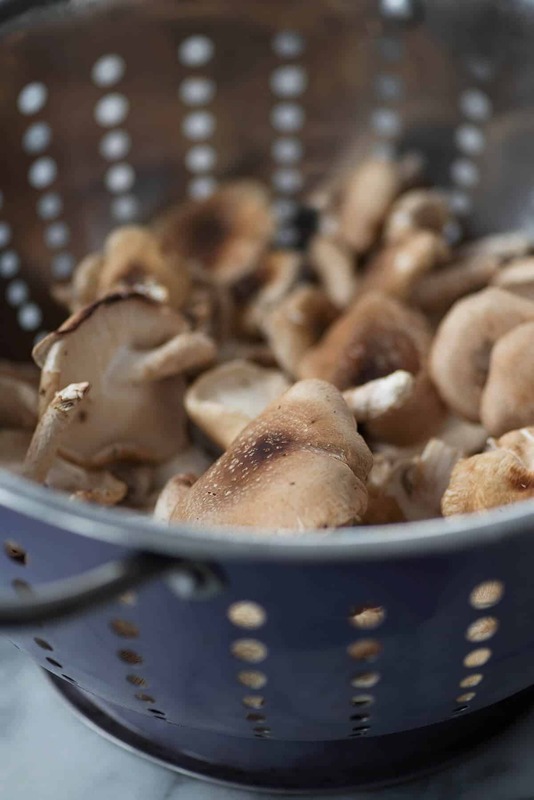 While the mushrooms are cooking, bring a large pot of salted water to a boil. Add the linguine and cook for a little more than 1/2 of the recommended time on the package. Add the very al dente linguine to the skillet along with 2 ladles of pasta water (not regular water, pasta water has starches that allow the sauce to cling). Increase the heat to medium-high and continually toss the noodles with the sauce. Once the water is absorbed, add more water, 1 ladle at a time, until pasta is al dente and cooked through. Remove from heat and stir in the butter and parsley. Toss again and serve. 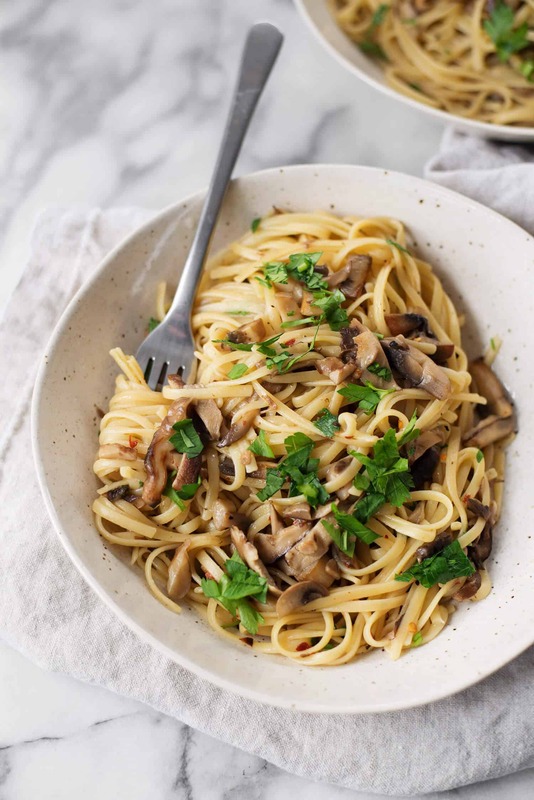 I love mushrooms so this pasta looks amazing!! Beautiful photos! I love shiitake mushrooms! Looks like such a comforting and delicious bowl of pasta! This looks delicious. I have some grilled frozen asparagus from Trader Joe’s that I think would be great tossed in. BTW, I will scrape the pan rather than scrap the pan. Ha! What can I sub for wine? Hi Moni, the wine helps to deglaze the pan and add’s a little acid and flavor. If you don’t want to use wine, I would use a tablespoon of lemon juice or white wine vinegar instead. 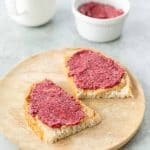 Is cooking wine a suitable substitute for wine?